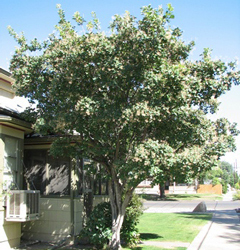 Growth habit More like a tall multi- stemmed shrub, but it can be pruned into a tree. Height is usually no more than fifteen feet by twelve feet wide. Form is almost always irregular and informal. Foliage Rounded form with smooth margins. Leaf veins contrast with the leaves making them somewhat showy. Flowers Very unique and attractive puffy cloud-like blooms with leaves in the background. From a distance these blooms resemble puffs of smoke, hence the name. Fruit Small quarter inch in size and kidney-shaped. Bark The main trunk is gray and furrowed. 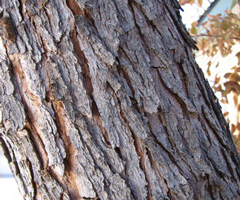 Bark starts to flake off a little with maturity. Twigs On one year-old branches the bark is light brown to reddish brown. Insects and diseases No major pest problems observed on this tree. 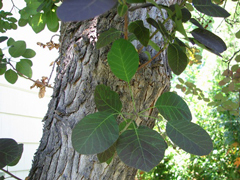 Landscape value The plant is tolerant of clay soil, alkalinity and exhibits drought tolerance. There are no less than 15 cultivars of this plant in the nursery trade. 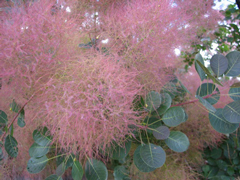 Most are variations of the same theme with purplish leaves and soft pink to red flower heads. This plant is very showy and is commonly used as an accent plant in the landscape. 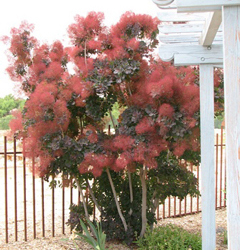 There is a native called American smoketree (Cotinus obovatus) but it is a much larger plant up to 30 feet tall. Its normal range is from Texas to Georgia along the southern tiered states.